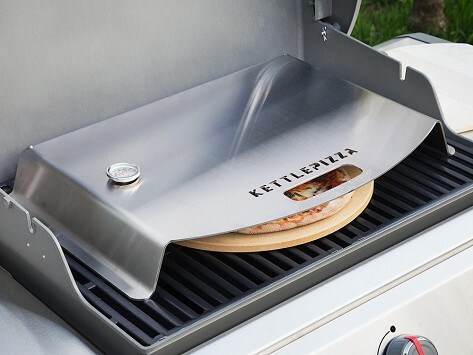 This stainless steel insert transforms a gas grill into a grill top pizza oven. It sits on the grill grate and is designed to maintain and circulate heat to cook a crispy pizza in about eight minutes. Dimensions: 24" x 17" x 4"; Deluxe: 24" x 17" x 5"
Weight: 25 lbs. ; Deluxe: 27 lbs. Gave one to my husband as an early Christmas gift and we both fell in love - so ridiculously easy to use - I may never order take out pizza again!! Best Pizza Oven Anywhere -- and it's in your backyard!